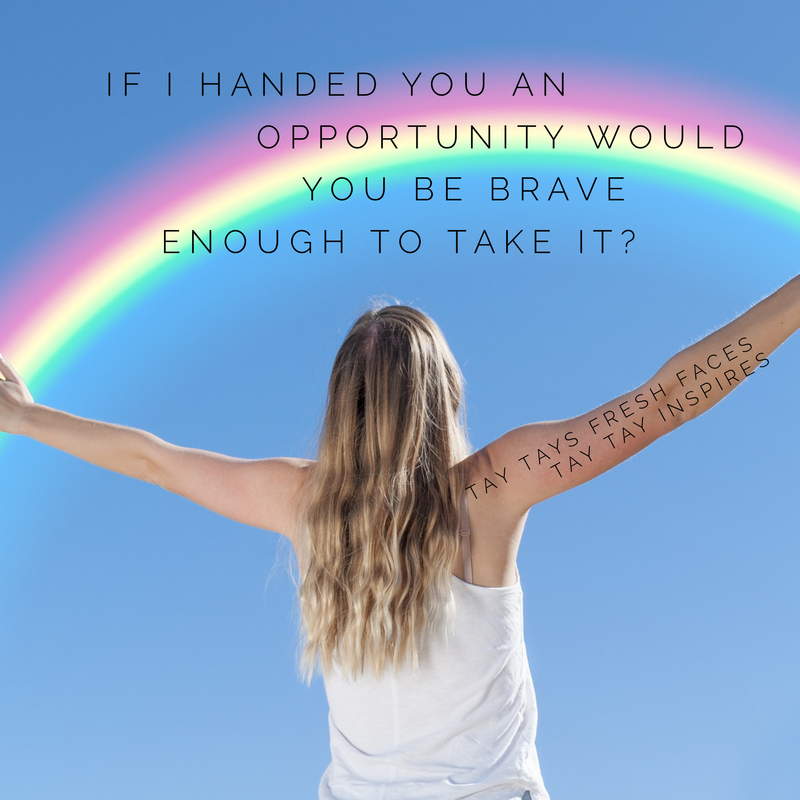 If given the choice, would you choose opportunity or fear? Every day we have a choice. We can continue on as we have in the past, or we can decide it’s time for a change. We have to take control of our futures, and our lives. We have to learn that it’s never to late for another dream! I actually teach people how to believe in themselves again. I teach people how to find that little voice inside, that might have gotten lost. In February I started my first network marketing gig from home. I would have never guessed that it would lead me to Tay Tays Fresh Faces, or Tay Tay Inspires. I thought I was just going to make a little extra money, and get my product free. As it turns out I was completely wrong about all of this. If I hadn’t been brave, I wouldn’t know you at all. There would be no Tay Tay Inspires, there would be no fresh faces. Here’s what’s so awesome about courage and faith, it’s so much bigger and better then I could dream up for myself. My plans were so little in comparison to what I’m actually doing. I I thought I would be content where I was, but it turns out God has other plans for me. So here I am, putting together a team of authentic superstars, and we are going to rock it. I realize now that the bigger picture is teaching others how to do the same. I realize now that my dreams were not big enough, but they were enough to get me started. You don’t have to quit your job, to start a part time hustle. That’s why the business runs from your home or your phone. It’s your business to run the way you choose. You can make it part time or full time. You can grow crazy fast, or you can take it super slow. There’s no right or wrong here and that’s what I love about this company. I love that there are no silly quotas. I love that you can be successful with, or without a team. I love that I waited for the business that was right for me. If your already a network marketer, I challenge you to compare our compensation plan with yours and tell me what you think. You have a couple choices after reading this. 1. You can play it safe and watch behind the scenes as I build my team. 2. You can listen to that little voice inside your soul that believes in you. You can nurture it, and take care of it by creating your own dreams. I’m going places the question is, who wants to go with me?